Spaniels can be traced back as far as the 14th century where dogs were being bred to be either water or land spaniels based on their characteristics. The word "cocker" came from the woodcock that the smaller land spaniels were used to flush out. 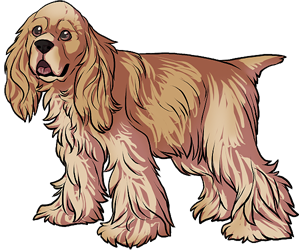 The American Cocker Spaniel, known as just the Cocker Spaniel in the AKC, was bred down in size as well as for slightly different traits from the English Cocker Spaniel when they were brought to America. While they are not as commonly used as hunting dogs anymore the Cocker Spaniel still makes a wonderful family companion. The first spaniel brought to Anerica travelled on the Mayflower in 1620. The Cocker Spaniel is the smallest sporting dog breed recognized by the AKC. American Presidents Richard Nixon and Harry S. Truman have both owned Cocker Spaniels as pets in the White House.